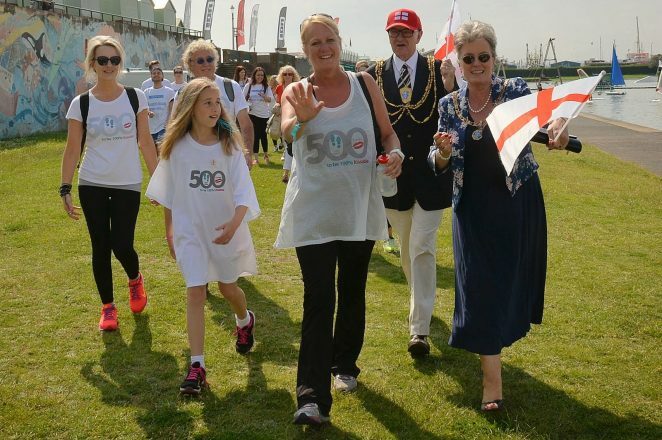 To mark National Smile Month, Dental Hygenist of the Year, Brighton and Hove resident Christine Chatfield, walked ‘500 miles 4 Smiles’ from Scotland to Brighton to raise awareness of the growing threat of mouth cancer. Christine’s walk took her to over thirty towns and cities. She raised money by inviting people to join her on a section for a nominal fee, text donations and sponsorship. In Brighton and Hove, the Mayor and Mayoress, Councillor Brian and Mrs Norah Fitch, joined her on the final lap and toasted her success in champagne.